From when the camera focused on Faye Dunaway and Warren Beatty standing on the podium at the Oscars until the point that the mistake was made audible with Faye Dunaway saying, “La La Land” took about 23 seconds. In those 23 seconds, Warren Beatty opens the envelope, looks down at the card, looks perplexed, shares several glances and a few chuckles with Faye Dunaway, shows her the card, starts “And the Academy Award”, pauses for a few more giggles and glances, continues “For best picture”, shares yet another glance and chuckle and finally hands the card to Faye Dunaway who announces, incorrectly, that La La Land has won the Oscar for best picture. In reviewing the footage on YouTube, it is obvious, very early into that 23 seconds that Warren Beatty knew something was wrong and shortly thereafter Faye Dunaway knew something was wrong. As we have come to find out, what was wrong was that Warren Beatty and Faye Dunaway were given the wrong envelope containing the wrong card. But until the wrong name was read and acceptance speeches given, the error was a relatively minor one. So, what could have been? Instead of pausing to speak up or gathering additional information (such as asking one of the many producers or directors just offstage), Warren Beatty and Faye Dunaway continued even though he knew something was significantly amiss. And in the end, Warren Beatty didn’t even finish his assigned task, he deferred, giving Faye Dunaway the pleasure of being the voice of the largest error in Oscars history, “La La Land”. 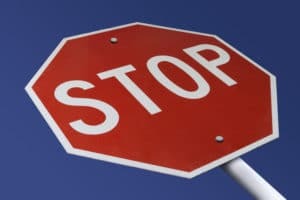 A critical element to a strong safety and quality culture for any organization is the Stop Work Authority which allows ANY employee to stop any work or behavior deemed unsafe to themselves or others. SWA programs also teach that employees will not be penalized for stopping what they perceive as unsafe work or conditions or speaking up about perceived hazards. Further, a best practice for SWA programs is to make sure employees know it is their RESPONSIBILITY to use their SWA when they spot an area of concern or when they are unsure about something, not merely to look the other way or go tell someone else. From a quality perspective, Toyota integrated this concept in its Toyota Production System as Stop The Line Manufacturing, teaching every employee on the assembly line that they have the RESPONSIBILITY to push a “big red button” generally located at their workstation whenever they notice a defect on the assembly line which could lead to problems with the quality of the goods being manufactured. The “big red button” shuts down the entire production line and again, employees are taught that there will be no retribution for pushing that button. Both Stop Work Authority and Stop The Line Manufacturing give the power to those working in the process to prevent errors/accidents/injuries. No questions need to be asked, no bucks passed, if you see something…do something….now. So, once Warren Beatty and Faye Dunaway were on the podium, camera on, queued up, wrong envelope in hand, what could have been done to prevent the error from getting worse? A little Stop Work Authority or Stop The Line Manufacturing mindset would have resulted in a bit of awkwardness but would have lessened the blow from the greatest error in Oscars history. How much reputational damage has been done to PwC because neither Warren Beatty nor Faye Dunaway hit their big red button? How awkward was that scene Sunday evening? How much bad press has resulted to all involved in this episode?